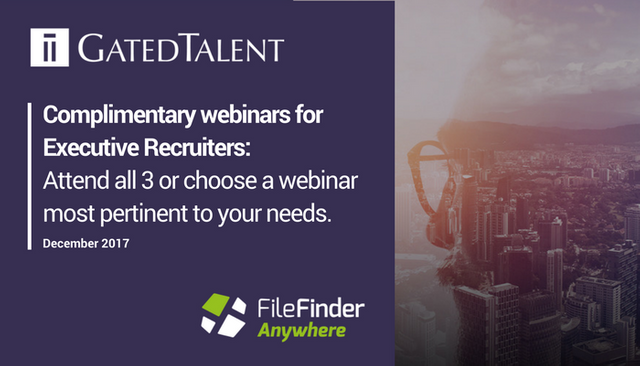 GatedTalent is the single biggest change to your FileFinder user experience ever. Learn how you can clean your data, discover new talent and stay compliant – all without leaving FileFinder! DECEMBER 7 - My data’s a mess! Many Executive Recruitment firms have thousands of records – but much of it is outdated. How can you clean it? How can you refresh it? Join us to learn how GatedTalent can help for less than a dollar a day! Following a recap of the main GDPR issues facing Executive Recruiters, Alex James and Jason Starr will answer your top questions regarding GDPR compliance to help you get ready for the May 2018 live-date. Submit your queries via email to webinars@dillistone.com by Dec 11 / Dec 18 respectively or ask them during the live broadcast – we will endeavour to answer as many as possible during this extended 45-minute webinar.